My mum's got quite a few handy friends when it comes to cookery and one of them recycles all her cookery magazines by giving them to me- A lovely gesture, and it's eco-friendly! Pouring over them is a great way to find new recipes and tips and this was one that I found in BBC's Good Food Magazine. I would really recommend it! It's full of good ideas and new things to try and well as the old family favourites. The more confident chef might find the recipes a bit tedious, but they're just right for me! It was simple to make and turns out to be a really tasty mid-week meal. The garlic cheese really compliments the roasted vegetables and the simple rice contrasts from the bold flavours of the other ingredients. I think the colours also look amazing, as there's nothing worse than a dull-looking meal; it makes it look so unappetizing. Preheat the oven to 200C/180C fan/ Gas Mark 6. De seed the peppers and cut into chunks. Cut the onion in wedges and mix together with the pepper in a baking tray. Drizzle with oil. Cook for 10 minutes. Cut a horizontal slit into the chicken breasts and push equal amounts of the cheese into them. Smooth the slit and brush with oil. Add them to the tray along with the tomatoes and olives and season. 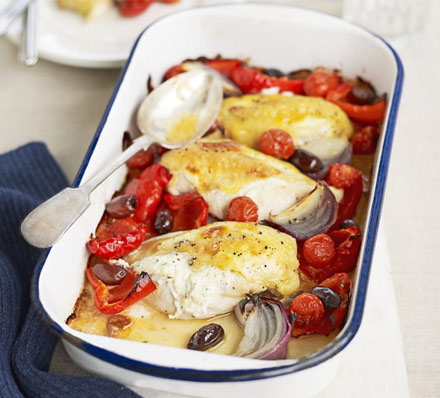 Return to the oven and cook for a further 25-30 minutes, until the chicken is fully cooked. Serve with rice white. I won't include quantities as I don't actually weight out rice. But I usually cook it for short bursts in the microwave on a lower heat setting. This meal would also go lovely on couscous and you could add some green vegetables, for instance mange taut, to add even more colour! The picture above is from BBC's Good Food Website as mine didn't turn out very well!